Steven J. Bennett was born in Beaver Dam, WI and graduated from Beaver Dam High School. Steve graduated from the University of Wisconsin – Milwaukee with a Bachelor of Science degree in Business Finance. Steve had worked at Resolute Systems in the Account Receivables Department and at ICM, Corporation as a manager. Sandra A. Jakubczak was born in Milwaukee, WI and graduated from Pius XI High School. Sandy graduated from the University of Indiana – Evansville with a Bachelor of Science degree in Psychology. Currently, Sandy works at M&I Wealth Management group within the Client Services Department. In February 2000, Steve met Sandy and became interested in her uncle’s line of business – SAUSAGE! In 2001, Steve started working for Frank Jakubczak, owner of European Homemade Sausage – Milwaukee, WI, as an apprentice. As Steve was learning the business throughout the years, an opportunity appeared in Port Washington, WI. In April 2005, Steve and Sandy Bennett moved to Port Washington, WI and purchased Bernie’s Fine Meats from John and Jan Salchert, owner’s since 1974. Port Washington - Bernie Skeris has been a fixture in downtown Port Washington for more than 60 years, even though he hasn't worked there since the mid-'80s. Despite his death Thursday of colon cancer at the age of 87, Skeris' memory will live on, thanks to the Bernie's Fine Meats sign that adorns the butcher shop he ran from 1941 until he sold it in 1974. John Salchert, who went to work for Skeris in 1963 and bought the store from him in 1974, kept the name on the shop on Franklin St.
That has often confused people, especially newcomers to the city - that is, those who've lived there less than 20 years - who think Salchert is Bernie. "A lot of people call me Bernie," Salchert said Sunday. "I don't care. It comes in handy when the bill collectors call." Skeris opened Bernie's Fine Meats in May 1941. His shop is the lone survivor of a day when there were eight or nine butcher shops in Port Washington, as well as more than a dozen neighborhood grocery stores, Salchert said. But Skeris and Salchert outlasted them all, becoming well-known for their sausage recipes. "Bernie was a good sausage maker. And he liked people," Salchert said. 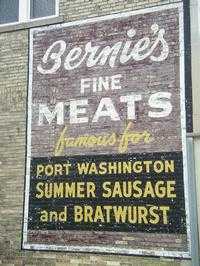 Bernie's Fine Meats also established a good reputation throughout the Great Lakes. In the 1940s, Skeris began doing the grocery shopping and providing meat for the Lake Michigan freighters that docked in Port Washington and unloaded coal for the We Energies power plant. After he sold the shop to Salchert, Skeris continued to work there another "10 or 12 years," Salchert said. Skeris was a native of Sheboygan and began working as a butcher there in the 1930s. After he started working in Port Washington, Skeris commuted every day on the Interurban Train from Sheboygan, according to his granddaughter Shelly Kleinschmidt of Milwaukee. It was in Sheboygan that he met his wife, Helen Chisauski. She died in 1999. Skeris died Thursday at about 2 a.m. at St. Mary's Hospital Ozaukee, having checked in there on Tuesday, about a month after being diagnosed with colon cancer, Kleinschmidt said. News of Skeris' death spread rapidly. "Thursday morning I went to the house (in Port Washington) and people were coming over already," Kleinschmidt said. Kleinschmidt and Salchert said Skeris was an avid fisherman. But after his wife died, he spent less time up north and more time in the kitchen, Kleinschmidt said. "He would fix meals for us and send food home with us all the time. There was always something cooking at Grandpa's," she said. She said in his old age, Skeris was a "jokester and prankster. Even on the way to the hospital he was joking in the car with some friends who were taking him." In addition to Kleinschmidt, Skeris is survived by his sons, James and Peter, a grandson and granddaughter and two great-grandchildren. A rosary service for Skeris will be held at 4 p.m. today at St. Mary's Church, Port Washington. Viewing is at Eernisse Funeral Home, 1600 W. Grand Ave., Port Washington, from 4 to 8 p.m. today and from 9 to 10 a.m. Tuesday. His funeral is at 10:30 a.m. Tuesday at St. Mary's. Interment is at St. Mary's cemetery. The family suggestions donations to Port Catholic Schools. Appeared in the Milwaukee Journal Sentinel on July 22, 2002.